It's time for the three little pigs to get their revenge. Click here to play! They're heavily armed and need your help in showing the wolf whose boss. Help the piggies get their revenge and you will be handsomely rewarded! Stick with all three swine soldiers. They only appear on selected reels, but they will substitute for most other symbols to help you create more wins. 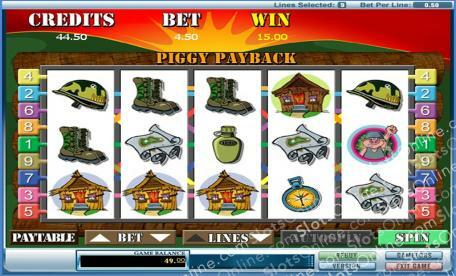 They will also trigger a bonus feature that will see you competing for even more big wins. You're objective is to get the Big Bad Wolf. Spin two to five of his symbol across an active pay line and you'll get up to 5000 times your line bet. The piggy houses are also there. Spin the brick house to get up to 2500 times your line bet. Spin the wood or straw house to get up to 500 times your line bet. There are plenty of other symbols to help you in your mission, including heavy arsenal, army helmets, compasses, maps, canteens and combat boots. The pigs have gotten their hooves on a tank, which will prove invaluable in this war against the wolf. Spin two to five of this anywhere on the board and you'll get up to 200 times your total bet. Can you help the three little pigs seek their revenge? Blow the Big Bad Wolf out of the water to bring home the bacon! The tank acts as a scatter. If you can spin two to five of this weapon of mass distruction anywhere on the board, you will get 1, 6, 20 or 200 times your total bet respectively. Each of the three little pigs act as a substitue. They will replace most other symbols (not scatters) to help you create more wins if you spin them on reels 1,3 and 5. The three little pigs will trigger a bonus feature if you can spin them on reels 1, 3 and 5. During this feature you will have to demolish houses to find the Big Bad Wolf. Once you knock down the house with the wolf in it, your prizes will be reveald.